We are now offering Cosmic Climbing Parties! Adults and children (ages 5+) alike will enjoy this one of a kind glow-in-the-dark climbing experience. All climbing holds, tapes, and rope glow under black light. Parties include equipment, staff and glow sticks for all quests. We can play our music or you can bring your own! Cosmic Climbing Parties are only available on Friday nights after 9pm or Saturday nights after 10pm but you can have a standard rock climbing party any day or time of the week! To inquire, please call our Facility Coordinator at 818-880-2993 and ask about our rock climbing parties. Our 35-foot indoor rock climbing wall is open to the public and is an exciting way for participants of all ages to challenge and enjoy themselves in a fun and safe environment. Whether you take a class, schedule a private lesson, book a rock wall party, or just drop in on your own during our try-a-climb hours, the rock wall will keep you entertained while you get a great core workout. Before you can climb our rock wall unsupervised, you must pass our rock climbing skills test. If you need to learn the skills required to pass our skills test, we offer a $30, small group/individual Rock Climbing Basics class that will cover everything. From birthday parties and school classes to corporate outings and non-profit organizations, everyone will remember a rock climbing party at the Community Center. All rock wall parties include necessary equipment and our expert climbing staff to belay party participants. 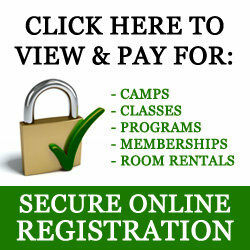 Please see the room rentals section for more details. BY RESERVATION ONLY. CALL 818-880-2993. Open climbing is available during our standard operating hours when classes/programs are not in session. * Priority is given to Try-A-Climb participants during the above Try-A-Climb hours. Times are subject to change due to rock wall rentals and classes. Every effort will be made to announce closings at least one week in advance. Please call in advance to confirm availability.